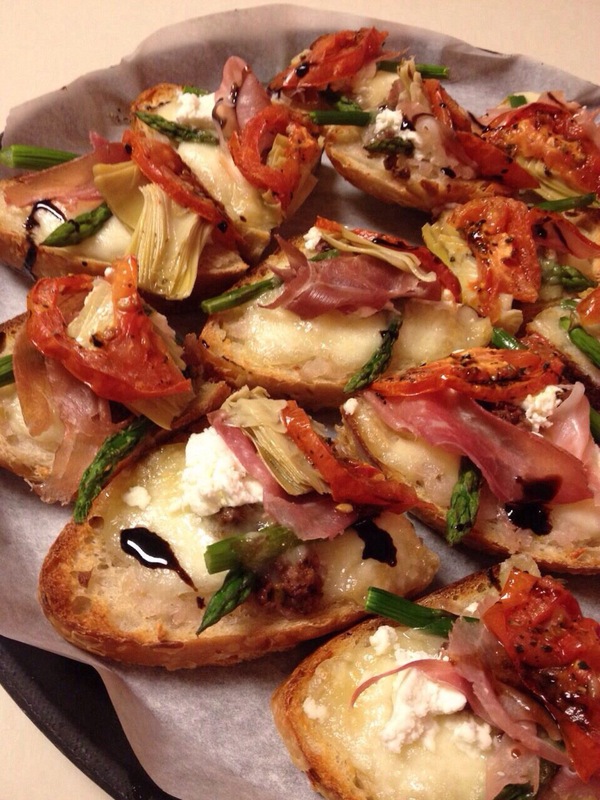 The Tasting Room in Seattle, Washington is exactly what you need. The small wine shop, tucked away, was a hidden gem on my trip to the Pacific Northwest. The small shop’s wooden tables and mismatched chairs was warm and inviting. Passing a couple playing Bananagram, my friends and I sat at a far table removing jackets and bags, literally taking the load off. The Tasting Room only sells wine from Washington and Oregon, allowing customers to fully immerse themselves in these types of wines. Washington and Oregon excel in Cabernets, Syrahs, Zinfandels, Pinots and Rieslings. The concept behind The Tasting Room is very simple; it is a place to come relax, play a few games and taste wine. 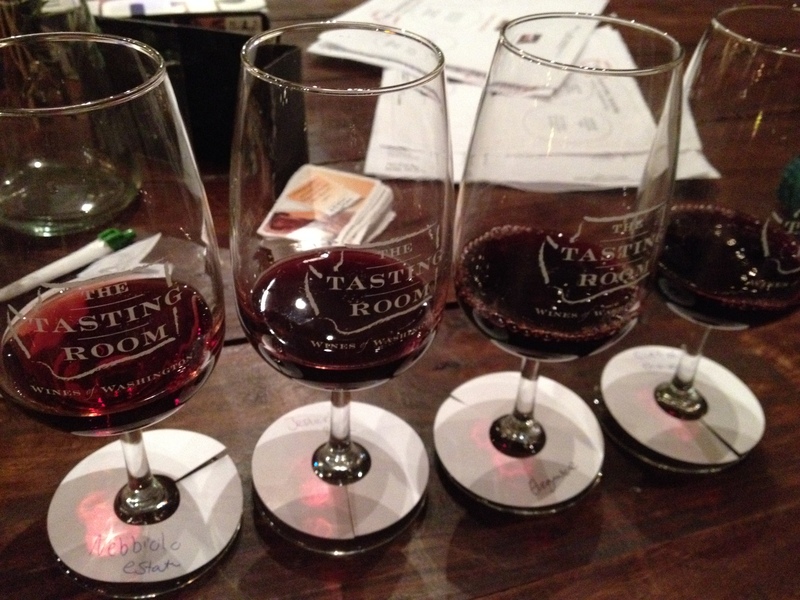 Tasting four wines cost just $10 and the price for a normal glass of wine between $8 – $15. While my friends randomly found Clue and began to set up the board, I perused the wine menu to make my four choices. There we were, tasting wine and playing Clue, like a bunch of East coasters. Somehow everyone knew we were outsiders… but we were accepted. Tasting wine can be done in so many ways, it all depends on the taster. Are you tasting to learn about new wine? Are you tasting to enjoy wine you already love? Are you tasting to drink more wine in a socially acceptable situation? All of these are legitimate. Honestly, tasting wine is entertainment. It’s fun and opinionated. You’re right, you’re wrong, it’s silly – bada-bing, bada-boom! Regardless, we enjoyed a minute out of cold, wet Seattle and stumbled into a place I’ll never forget. Oh, and it was Professor Plum with the Baseball Bat in the Observatory. 1. 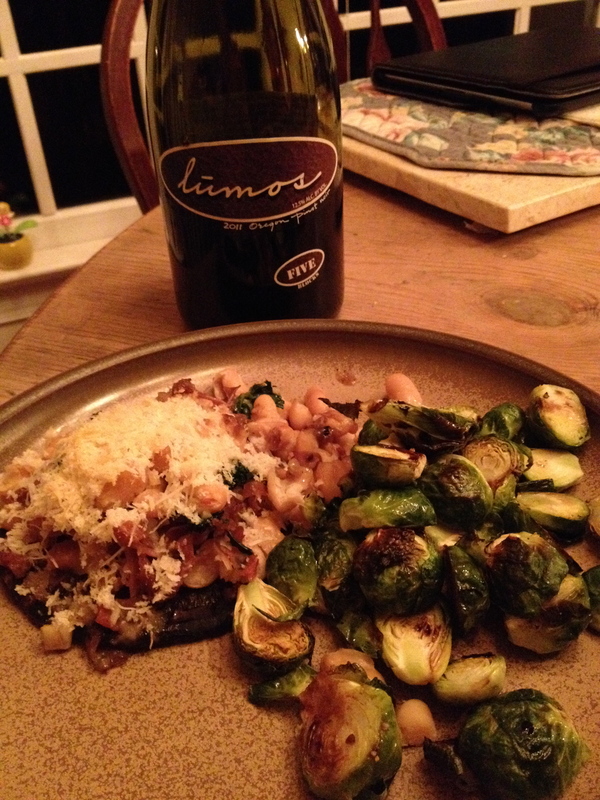 Wilridge Winery – Estate Nebbiolo 2010 – Flavors of pepper and currants, full of tannin. 2. Harlequin Wine Cellars – Jester’s Red 2007 – 58% Syrah, 42% Zinfandel. Light and sweet – fruit forward with touches of honey and anise. 3. Camaraderie Cellars – Elegance 2007 – 60% Cabernet, 20% Merlot, 10% Cabernet Franc, 5% Malbec, 5% Petit Verdot. Chocolate nose, smooth and clean. The Malbec softened the fruit, the Petit Verdot added tannin. 4. Nota Bene Cellars – Ciel du Cheval 2009 – 59% Cabernet, 27% Cabernet Franc, 14% Merlot. Notes of vanilla, toast, currant and blueberry. I’m aware that the wine racks in any store can be daunting. Which one? What is my price point? Why is that Malbec wearing a grin, is it mocking me? Hey, no judgment here. Wouldn’t be the first time I’ve had a staring contest between two bottles of wine, unable to make a decision. I’m here to make your life easier with a list of terrific winter wines, perfect for parties or presents. But first, this short anecdote: I was invited to a birthday party dinner. I didn’t really know anyone, save my friend who had invited me. Even though it was a family affair, I wanted to bring something. I felt bad just bringing myself – so I went to my go to wine store and picked 14 Hands, “Hot to Trot.” This wine is not only delicious, but it’s a red blend, therefore able to please just about anyone. It’s also a fabulous re-gifting wine. I snagged it, purchased it and was on the road, already late due to having to get the wine in the first place. I arrived at the restaurant, told my friend about my wine gift for the birthday girl; thirty seconds later I was informed this was her 20th birthday (Insert sound effects of a bomb exploding). I handed it to my friend. Re-gifted. Boom. We all want to be the discoverer; the one in the know. There’s always that one person who knows about something really cool before everyone else. Jerks. But that jerk could be you!! Beaujolais is making a comeback, but it’s still in its beginning stages of come-back-ness. This means you could still possibly be the first to bring this wine to a party and be the discoverer! Interestingly enough, I am seeing a couple shifts in red wine taste at the moment. You do still have the wine snobs, they are set in their ways. Just smile, nod and back away slowly. This shift however, is happening and it’s moving towards old world grapes. There has been a shift in red wines to spicy and/or fruity. A few years ago it was Malbec. Everyone and their mother wanted Malbec. Now, believe it or not, tastes are moving to sweeter reds (more fruit forward). I’ve gotten the question pretty often over the last year or so, “Do you know of any sweeter reds?” I do and Beaujolais Nouveau is one of them (Disclaimer: this mightn’t be you at all, don’t freak out). Let’s learn a little bit about Beaujolais and Beaujolais Nouveau; what they are, where do they come from and why this time of year is important for Beaujolais Nouveau. 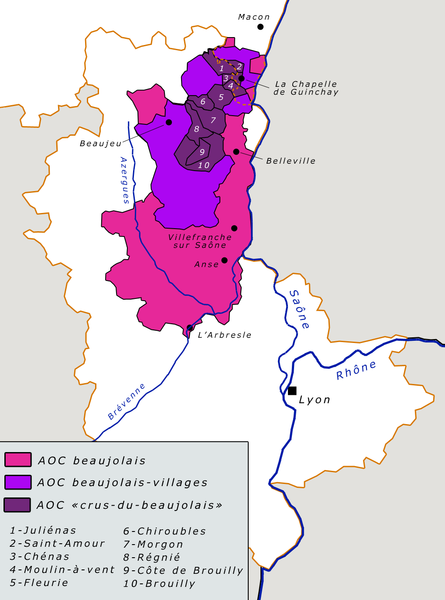 The Beaujolais wine region is located north of Lyon, France. The wine is traditionally made from the Gamay grape. Beaujolais is characteristically lower in tannin, higher in acidity and therefore light bodied. This comes almost directly from the Gamay grape having a thin skin (Skin being the place where many wines receive their tannin or dryness). Beaujolais was extremely popular in the 19th century and from this popularity Beaujolais Nouveau was created. The Beaujolais Nouveau craze really began in the 1980s, where lighter, fruitier wines were preferred over heavy reds for easy drinking. 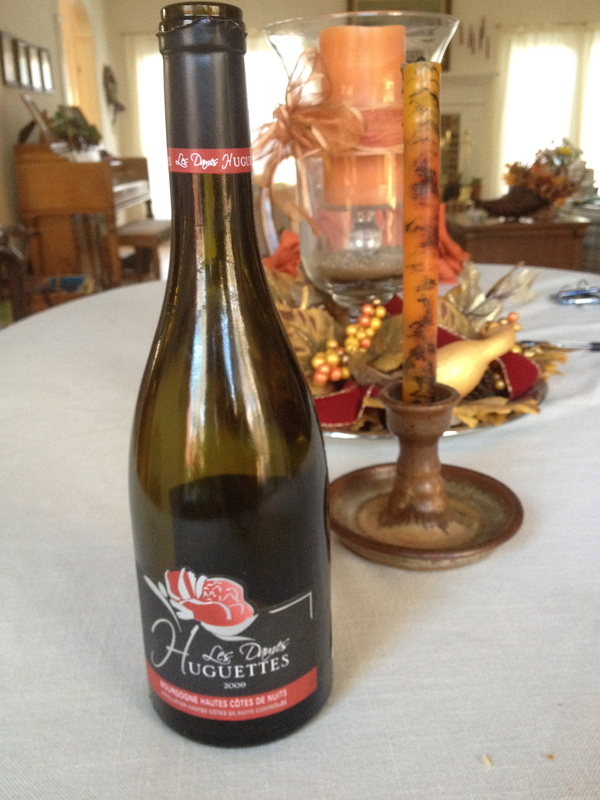 Georges Duboeuf, a lucrative marketer caught on to these high sales and tried to capitalize Beaujolais Nouveau’s success. This craze didn’t last too long and soon Beaujolais and its sister wine Beaujolais Nouveau fell off the map. Duboeuf wasn’t finished with Beaujolais Nouveau and continued on to create “Beaujolais Nouveau Day,” the third Thursday in November (that was last week!!). It has become the most popular early release wine day, where the wine is fermented only a few weeks before going on sale. 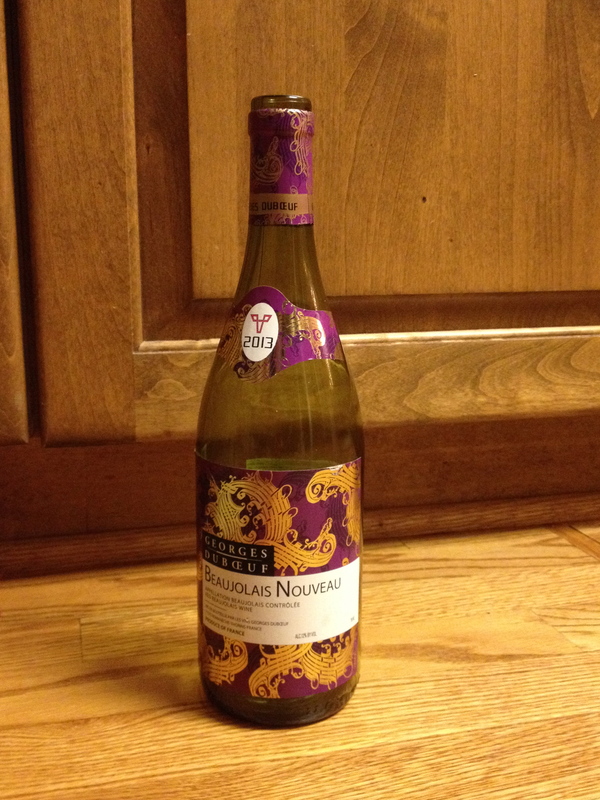 Didn’t get your Beaujolais Nouveau last week? You’re still in luck! You can still find bottles of this slightly sweet, very fruity, highly acidic red delight. Hey, you can’t say you don’t like it until you’ve tried it. Now you know the story and can tell everyone why you’re bringing Beaujolais Nouveau to the party. Now, how do those commercials go? Oh yea! Discover Beaujolais. But then again, I wouldn’t know. I just know it was really great food with some really great people. 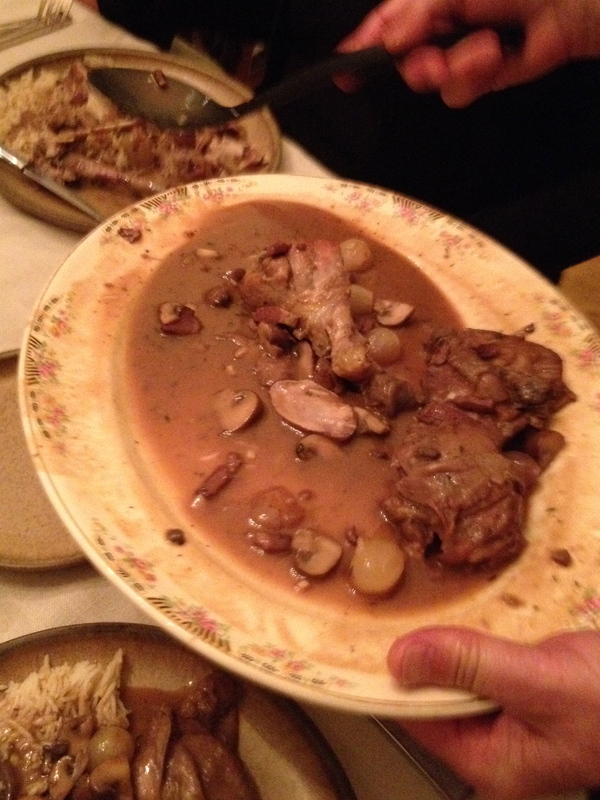 Sunday night my father attempted (and succeeded at) Julia Child’s recipe on Coq au Vin. We didn’t have an old rooster as some of the old French recipes might call for, but it was still on point. I was a little late for dinner because of work, but don’t you know I made up for it by bringing the wine! 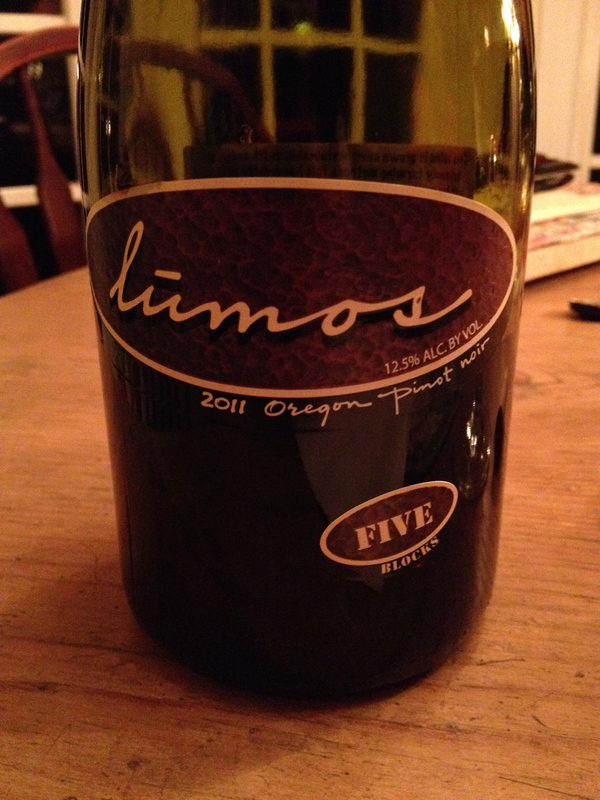 This wine gets a little bit of shtick online, but I thought it was really nice. Red Burgundys are really great and I certainly don’t drink them enough. Well, they are usually Pinot Noir, so I drink plenty of those, but not many from France. They are seen as too light, not having enough fruit, not having enough tannin or not having enough structure in general. Sometimes, if it quacks like a duck…. They aren’t trying to be anything else. 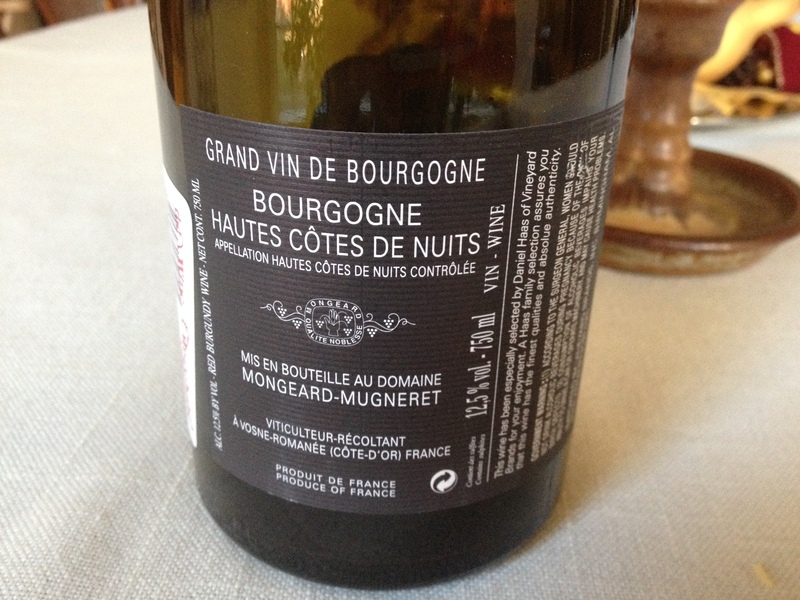 I take Burgundys for what they are – elegant. I got this one at the Wine Merchant in Cary. With this one in particular, the nose smelled like a dark red, full of dark fruits. There was no astringent smell at all, only freshness. The color was amazingly bright ruby red and on the palate bright fruit of cherry to match its color. 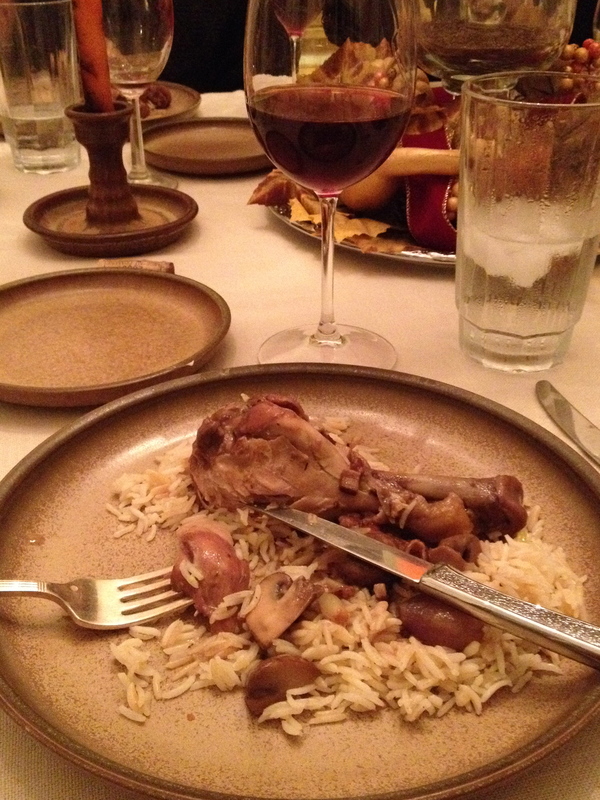 The wine was soft, but with the exact flavor that I wanted with the meal (My dad had already told me he would be using an Oregon Pinot Noir in the Coq au vin). I knew I needed something to match. Though they are completely different styles of Pinot Noir, it worked because the sauce was light enough to hang on with the French Burgundy. The smells and tastes lingered together and didn’t overpower one another. The Coq au vin came out beautifully, even though it had to be reheated! The chicken was tender, the onions were cooked perfectly and the mushrooms full of richness. And the sauce! Light carmel colored liquid gold – I love that the sauce wasn’t too rich or too overbearing like gravy can sometimes be. It dripped with lusciousness without causing that over-full feeling and soaked the rice under the chicken nicely. Add bread and butter and I couldn’t help but to eat as slowly as possible to savour every bite. It’s fun how some of these French recipes become an accomplishment, you have to try them out! It’s at these times that we feel like we can really go travel anywhere. Sure, we weren’t in France, but we were acting French. French peasant food with array of fresh breads, cheese and salads, beautiful red Burgundy and a table of friends. At once, we are transported to a new culture and loving every minute of it. Well, here we are Wednesday and hadn’t made the Sunday meal post yet. Ah sure, it seems easy to write a blog continuously, but sometimes life really gets in the way. These long days are making my brain shut down and all I think about are these Sunday dinners. They have begun to bring together our family, our love of wine/food and of course centering our thoughts. What do you think about when you’re cooking or baking? Everything else going on in your life? Not me, I think about the recipe, what ingredient comes next, how will it look when it comes out. Then it’s done and nothing has really turned out the way you wanted it to, but the Taste! The taste makes it all worth it. The brussels sprouts were roasted in olive oil and balsamic glaze until done, easy. It was my dad’s birthday on Monday so I wanted to make his favourite dessert, but I was trying to keep it a secret. This was extremely hard to do as everyone was in the kitchen and they were all secretly wondering why I was making a shortbread crust and had 5 lemons? In the end, everything was delicious. 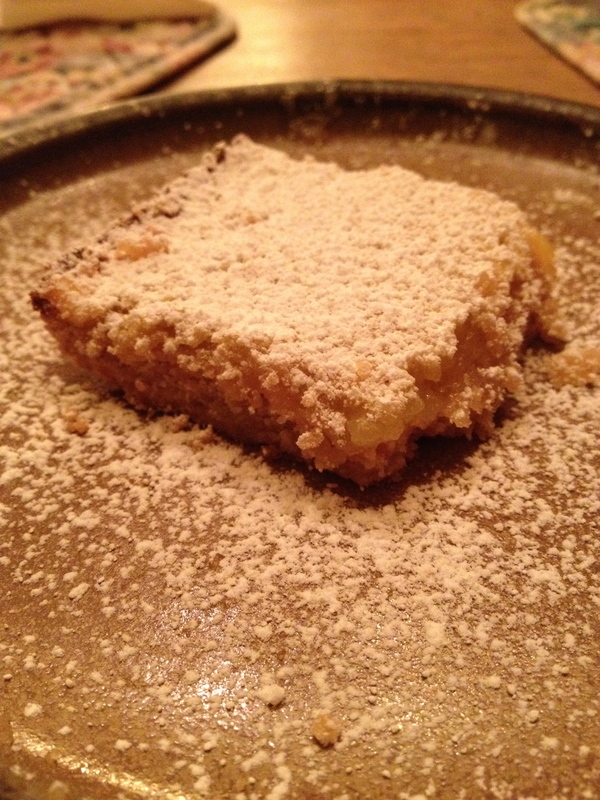 It really had great flavour and the lemon bars came out of the oven right on time. For this meal I chose a Pinot Noir from Oregon. 1. Mushrooms pair very nicely with Pinot Noir because of their earthiness and because the mushroom can stand up to a red wine. 2. 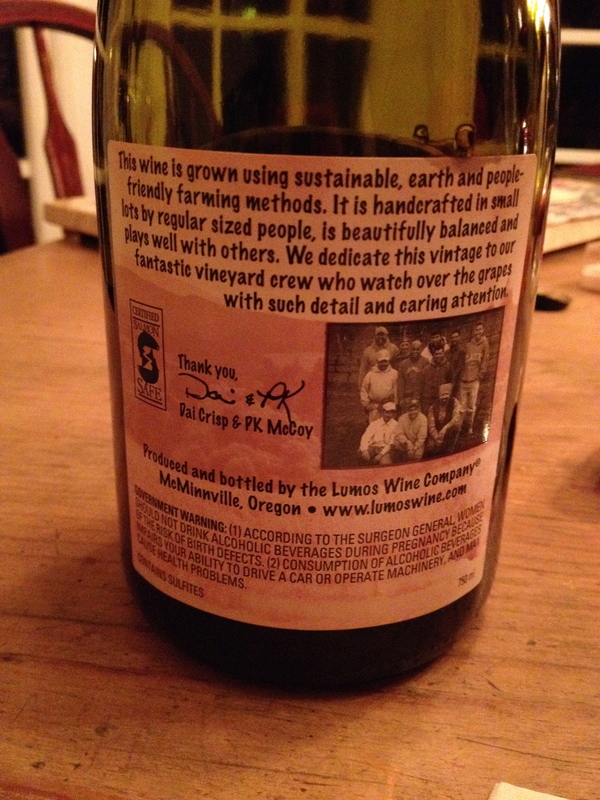 Oregon is known for the earthiest of Pinot Noir. 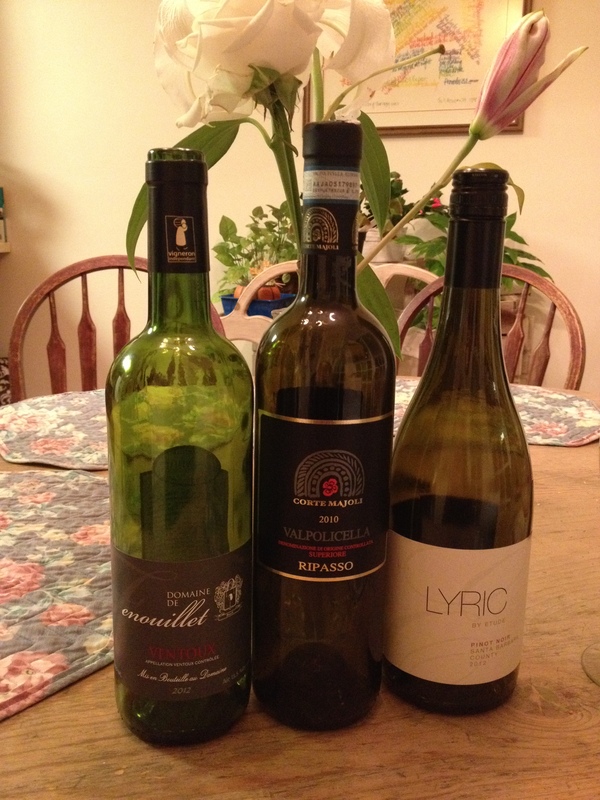 This time I went to Sip… a wine store in Cary to pick out my wine. I had my dad come with me to choose which one he wanted. The store had about 200 bottles of wine in it, there were about 4 from Oregon and 2 that were Pinot Noir; it took my dad about 30 minutes to choose. Typical eh? I guess all that really matters in the end is the effort we put into something to make someone else happy. The more we do for someone else, the more we find we want to do. Sitting at the table with our food and wine, room dimly lit by candles and filled with conversation and laughter. Who could pass that up?